I sailed out of Peniche on the morning of July 21, 2018, headed for the Algarve, for what I believe to be the 16th round trip. It just keeps getting better. 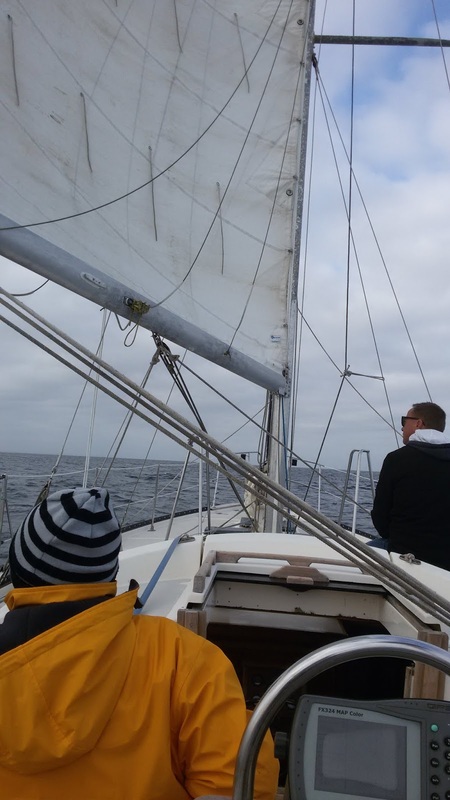 After a number of years of solo sailing, this time I had two crew members aboard and was shadowed by a buddy boat, a Bavaria 32. The youngest crew member, slept 90% of the time in the pilot house and was incredibly cheerful about it. The older crew, who's already owned a motorboat and two sailboats, alternated his time between fiddling with his newly purchased super expensive smartphone and soaking up the scenery. I'm always content sailing out of range of land-borne hassles, escaping from work and barking dogs. Motorsailing headed for Cascais with the crew. I've never motored so much as this year - 95 hours to be exact. Since I never use the engine to charge the batteries (although I run the engine while anchoring, raising sails etc. ), this translates into about 400 miles of motoring or motorsailing. The wind was either not there, not strong enough or on the nose. Good thing I dove on the propeller before departing and scraped it almost to perfection. Haven't hauled out in 2 years but the bottom is not too dirty yet. I'm going write a series of short posts about the trip. It's the 16th, but there's always something new as I get older. I think I'll also include a post on how to anchor (properly). Long ago, when I first started sailing, I knew nothing about anchoring, but at least I was curious, cautious and timid. What I now see over and over is a minority of sailors who don't know how to anchor but are cocksure, careless, stubborn and dangerous. Yes, I got hit again. I also have a plan brewing in my head, but don't hold your breath. Sorry about the "wrong" wind. It's always the case. Having a dependable motor must be nice....I always have a knot in my stomach...f-ing Perkins! I'm starting to think that Summer is the worst time to cruise. Way to many dangerous boaters. Just when you think you've anchored well and can catch some shut eye....bam!...some bonehead will show up and turn your paradise into a living hell! Not as bad as the dogs, but still.! My Kubota engine hasn't failed me once in all these years. However, this year it [I] ran out of diesel, in thick fog, and the alternator stopped working sometime during the summer but never noticed it because of the solar panel. But that's another story to be told. Sorry about your Perkins. I thought it was only the transmission. Oh, everything runs fine now. I just don't/can't trust it any more. Wow, You give such a informative content on your site. I really like your conetent. You give the correct info which i search here. By the way thanks for give us valuable post. I hope you will always give us educational and valuable post. You can check my site here Johnson outboard water pump kit. where i provide outboard repair tools services. You can follow my social sites. I will be back always on your website. Thank you have a nice day friend.